There’s a certain tug-of-war I’m always engaged in as a food blogger. It’s a battle between my desire to showcase cool and unusual ingredients, and my effort to feature food that is accessible. Lately, I’ve been thinking a lot about culinary accessibility, and how important it is within vegan activism. It’s easy for me to locate specialty ingredients (like superfoods) in the DC area, and even though being a student again has changed the way I budget my groceries, I’m often lucky enough to be able to obtain complimentary samples of new ingredients through blogging. This isn’t the case for everyone, everywhere, and I think it’s important to demonstrate that veganism is possible, practical, and delicious with ingredients that are more commonplace: legumes, vegetables, nuts, grains. That said, there’s a lot of joy to be had in discovering a food or ingredient for the first time, and being open to new flavors is part of being a food lover/blogger. So I guess my goal is to focus primarily on the basics, and still give some attention to specialty ingredients when I’m lucky enough to obtain them. Fortunately, today’s special ingredient, tamarind paste, is new and exotic to me, but it’s not new or exotic generally speaking. It is a common ingredient in many global cuisines. Best of all, it’s both reasonably priced and relatively easy to find in Asian or Indian food markets. Tamarind is indigenous to tropical Africa, but it is often produced in Southeast Asia or Mexico. You may have tasted it in Indian or Thai recipes. The best way I can think to describe it is very, very tart, with some sweet hints as well. As a lover of all things tart, acidic, and sour, I’m surprised it took me this long to try tamarind out. I’d tasted it in a dressing at Pure Food and Wine some time ago and loved it, but I’m happy that I decided to explore it at home. I’ve seen tamarind paste in Chinese markets, but I’ve read online that Indian markets and Mexican markets sometimes carry it as well. This time around, I found mine on Amazon. It was not inexpensive ($7.99), but certainly not too pricey, either. And because the flavor is incredibly robust, a little goes a long way. I wanted to use the tamarind paste in a dressing of some sort, and I had a thought to put it over kelp noodles and carrot ribbons. I’m very happy with how the resulting “noodle bowl” turned out—and the tamarind lent such a lovely, sweet and sour flavor to the dish. I’ll definitely be making the dressing again, and I’m also now mulling over new ways to use the ingredient. Anyone have a good suggestion for me? 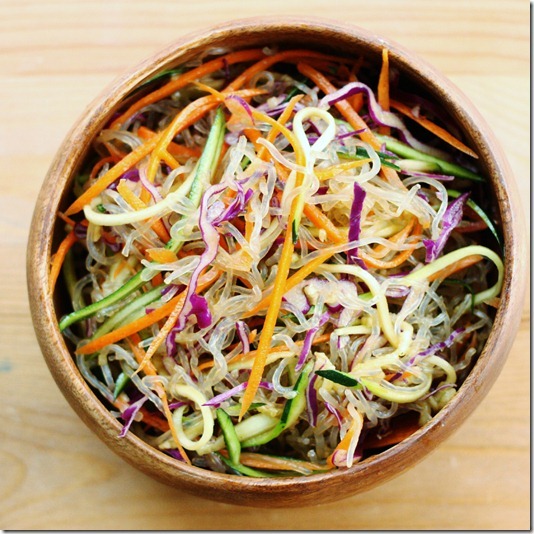 Mix together the kelp noodles, carrots, zucchini, and cabbage. 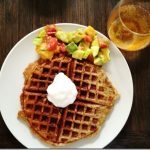 In a blender or with a small whisk, blend the tamarind paste, oil, lime juice, agave/maple syrup, and tamari. Massage about 3 tbsp of the dressing into the noodles. Add more dressing as needed. Transfer salad to two bowls and top with cilantro, if desired. Makes 2-3 servings. I would serve this salad with some legumes (toasted chickpeas, maybe?) or edamame. This week, I’m doing a fun tempeh tutorial in my New Veganism column for Food52. So I had some exceptionally tasty seared tempeh to serve my salad with! I hope you enjoy the salad. And please feel free to share your tamarind ideas with me (Janet, I know you’ll have some). I’ve gotten some wonderfully enthusiastic feedback on my raw, vegan “deviled eggs”—thanks to everyone who made them this weekend and commented or tweeted to give me a thumbs up! I’m so happy you enjoyed them. Previous Post: « Cashew and Squash Canapés: A Raw, Vegan Spin On Deviled Eggs! I thought kelp noodles weren’t really raw at all. They still contain Alginate and sodium which are often treated chemically through processing. I would think yam noodles would be the better option because they contain starches derived from veggies. Is there such thing as a “better” noodle? 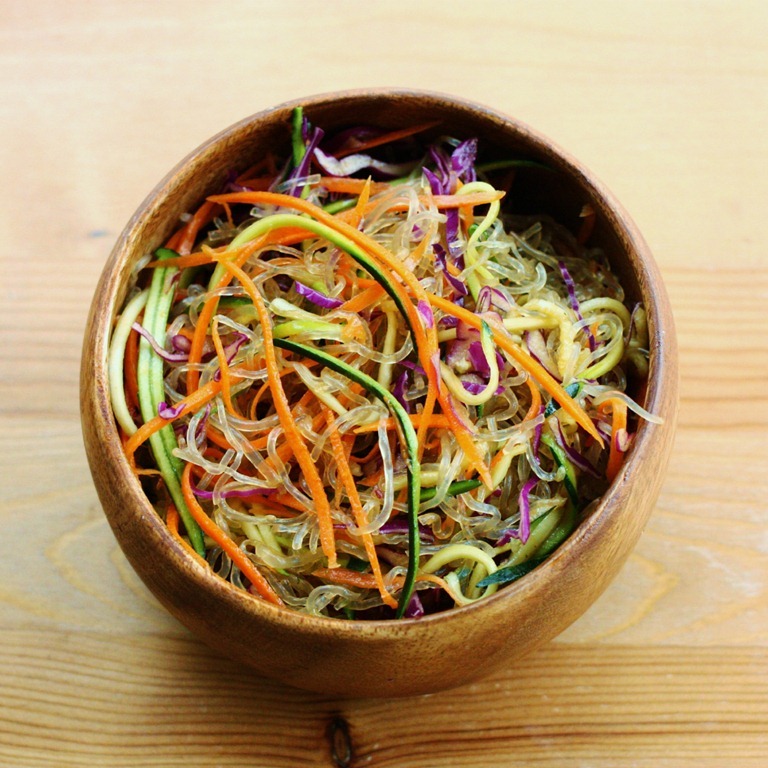 you can probably use any “noodle” and this recipe would still be good…like spiralized zucchini, sweet potato, eggplant…etc. I am a big fan of tamarind! My family is from Nicaragua and I grew up having tamarind juice and candies. It is a very nostalgic ingredient for me. I am personally a big fan of mixing tamarind with ginger in stir fry or asian style dishes to give them a sweet and sour type feel (with a hint of chili or cayenne). Not too different from your recipe. The ginger-tamarind combo is fantastic in general. 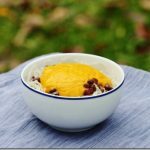 I made a delicious ice cream one time using frozen bananas, a couple dates, coconut meat, coconut milk, tamarind paste, grated ginger, and a hint of lemon. Good stuff if you like these kind of flavors! Good god that ice cream sounds wondrous! Great ideas, Karina! Thank you for sharing them. This looks so yummy! 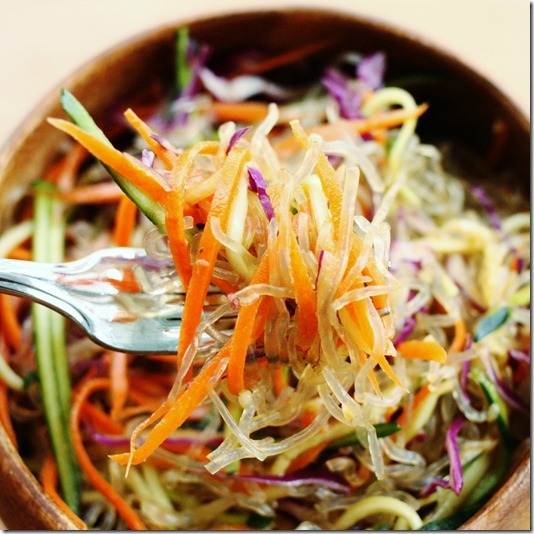 What do kelp noodles taste like? Do they have a similar taste to other seaweed? Is that flavor strong in this dish, or disguised in the dressing? I find that the taste is really bland/harmless. The texture does put some people off, though — they’re pretty crunchy, unless you let them marinate overnight. Still fun though. Thanks! I’ll give them a try—I live in Seattle so they should be easy to find around here! My husband and son love other seaweed products! Come to think of it, I may have used frozen mangoes, not bananas! See? I knew you’d have something amazing for me. This looks amazing and I will be trying it. Do they have kelp noodles at whole foods? I cannot seem to find them. They do, typically in the International aisle. In the Asian part, by the rice noodles etc. They usually don’t. Some health food stores have them, but your best bet is Amazon, where they are easy to get in bulk for a lower price! I will order them. I’ve enjoyed your blog…my friend, the chef at Pure Fare in Philadelphia told me about it. You would love Pure Fare. Hope you can check it out sometime. 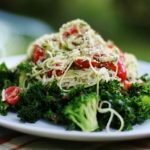 What a gorgeous salad and I loooove learning about new ingredients from your blog. 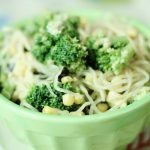 I recently tried kelp noodles for the first time, but wasn’t a big fan of the texture. A reader told me I should soak them overnight in water, so I’ll try them again and try to recreate your beautiful dish. That is one seriously beautiful salad! I bought tamarind paste for a recipe a while back, but it’s been sitting in my pantry because I wasn’t sure what to do with it next. Your recipe will put it to good use! These are some crazy amazing ideas, Elisabeth! I can’t wait to try them all. Oh my gooodness! I literally just ate almost the same thing, -I make recipe videos- for my blog and today I did an “Asian Pad Thai with Tamarind Sauce” !! 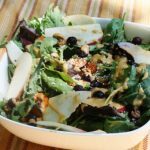 It is super similar, though I didn’t used many of the ingredients you used, I made a suuuper delish dressing with fresh tamarind pulp, dates and ginger. It was beyond tasty and I’m posting it this week:) Great to see you like tamarind! Tamarind makes pad Thai sauce so much better. Glad you like the recipe! That looks divine!!! Can’t wait to try it! Gorgeous, looks like such a refreshing salad! I’m quite new to tamarind, I’ll have to keep my eye out for it, I love tangy flavours. It’s been a while since I’ve had kelp noodles! There are some delicious sounding recipes in these comments too, love it! This looks wonderful, fun and colorful! Understand about exotic ingredients, there’s a lot available here too, but not when visiting family in rural Florida. Thank you for addressing the issue that a lot of people don’t have easy access or the funds for eating a really varied vegan diet. Just this morning I was game planning my husband’s month long stay in a Houston hotel for training…It takes a lot more effort than here in L.A. Thanks for the amazing idea. Trying to make my salads more exciting and I will definitely have to put this on my list of things to make. yum!! i love the flavor of tamerind. Thanks for the great recipe! i love all of those flavors but i have yet (and i saw this every time you post a kelp noodle recipe) to purchase said noodles haha. This salad looks so colorful it has to be good! Can you see it traveling well, like for a lunch on the go? Not sure if the Kelp with become one big ball or not. I’d love to have it along for work and not worry about refrigerating. Some of my favorite flavors all in one bowl, love it! I think it would be fine for at least a few hours, Angela! I want to second Isa’s Tamarind Lentils from Veganomicon. It really showcases the amazing tart flavor of tamarind. Of course also great in curries and pad thai and the sort. I couldn’t find tamarind paste so I used red miso paste and followed the remaining instructions. The salad was very good. Thanks! This makes me laugh! As an Australian, I’ve been using tamarind since I first starting cooking in my tweens, but kelp noodles are still not available in Canberra (at least, not when I left). It’s great as a marinade for tofu/tempeh, and I once used it in a dessert too. 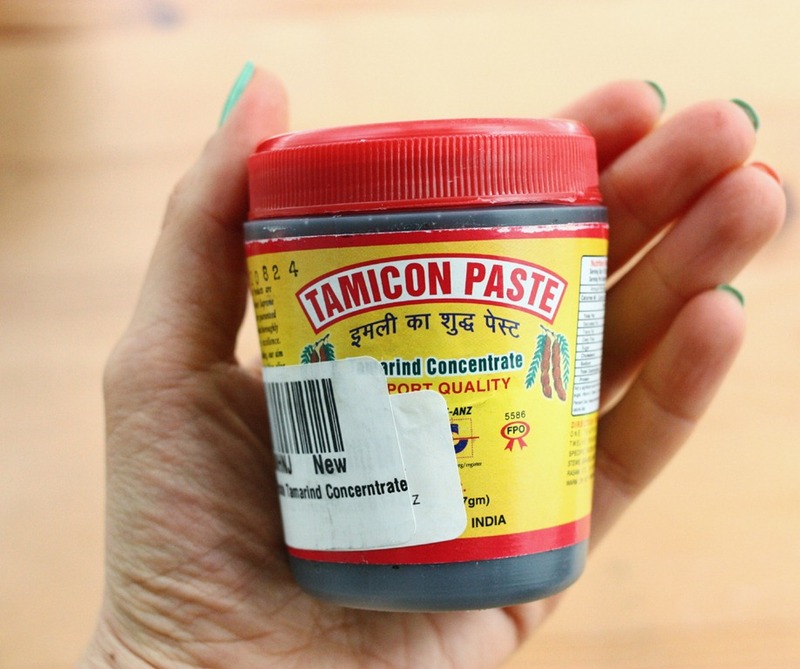 I haven’t tried putting tamicon paste. Does it taste good? This looks delicious!! I’ve been wanting to try kelp noodles, but I haven’t been able to find them locally in the D.C. area. I’ve tried Whole Foods in Arlington and Tysons and a few asian food stores too, with no luck. Any recommendations on where to get them around here? Thanks! If this is a key ingredient in pad thai, then most of us have tasted it. I like the idea of using it in a dressing. That gives you the opportunity to find out if you really like it before using it in a more complicated recipe. This isn’t the kind of meal I would ordinarily have thought of eating. But I’m getting tired of of the kind of meals I ordinarily eat. While they still taste good, there’s nothing new about them. Time to try something new and your noodle bowl looks kinda tempting! 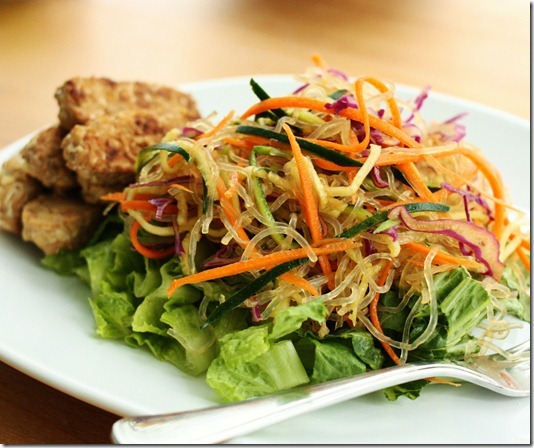 My husband and I have started eating more raw foods to help us lose weight. I’m always looking for new recipes. I have bookmarked your site for future reference. I love the way the salad looks — the colors are gorgeous. And tamarind is one of my favorite flavors — I always have a jar of tamarind paste in the fridge. We were just in Thailand and our Thai friends introduced us to another tamarind product that I’ve never seen before. We brought back jars of small pieces of tamarind coated with coarse salt. Oh my, that sounds wonderful! My favorite tamarind recipe is a Filipino soup called sinigang. It’s traditionally made with meat, like pork or fish, and many Filipinos eat the fish version during Lent. It’s one of those family recipes that I’ve always meant to cook myself, but still haven’t gotten around to making! 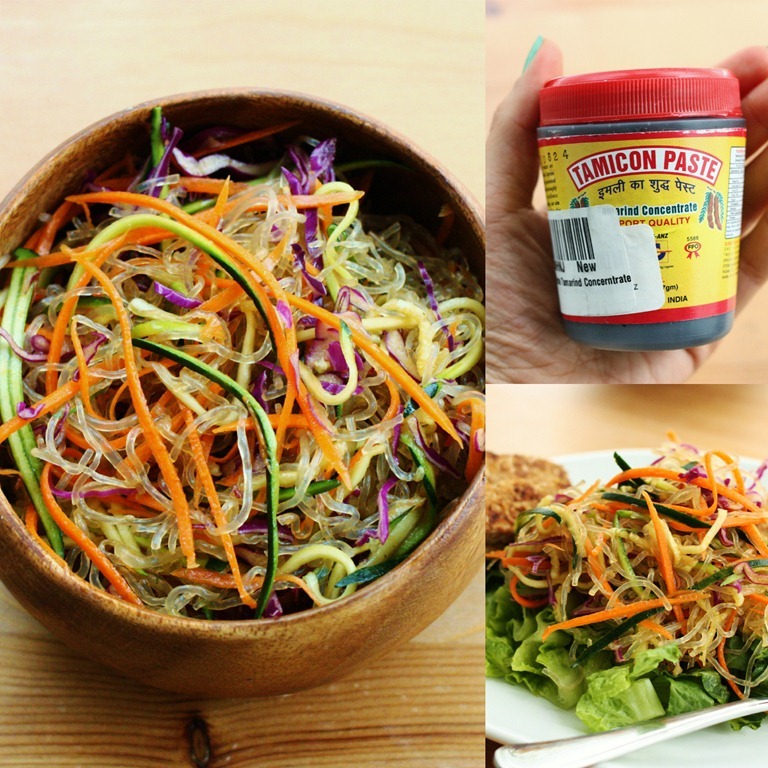 There are a few different vegan recipes available online, many of which also use a popular sinigang soup packet, but I’ve always preferred it with tamarind paste. This is such a bright and beautiful salad! I’ve never used tamarind for anything besides pad thai, but now I want to try some new things with it. This salad is first on the list, and the tamarind lentil recipe from Veganomicon will soon follow. Since the weather is warming, I’ve been craving much lighter meals. This will be a great one to munch on as I sit outside in the warm spring sun! I just made this for lunch and I love it!! I topped it with avocado and it was really good:) Thanks for all of your recipes, I make them often! Thank you for this recipe. I made it last night for my family and it was delicious! BTW I was not able to find the kelp noodles at Whole Foods but found them at Mother’s Market (I live in Southern California). I will be bookmarking your site Gena!